Although Iran's central bank has announced the release of new "credit cards," they are not credit cards in the ordinary sense, Hoshyar Rostami, an Iranian expert at Canada-based financial consulting firm Finapath, told Sputnik Persian. Iran's central bank has begun issuing credit cards for the first time, Iran's ISNA news agency reported on Sunday. The bank's director Valiollah Seif told ISNA that the cards, which are issued with limits of $3,000, $10,000 or $15,000, will slowly enter into circulation. The introduction appears to represent a liberalization of Iran's banking system, which has been subject to economic sanctions for more than a decade. 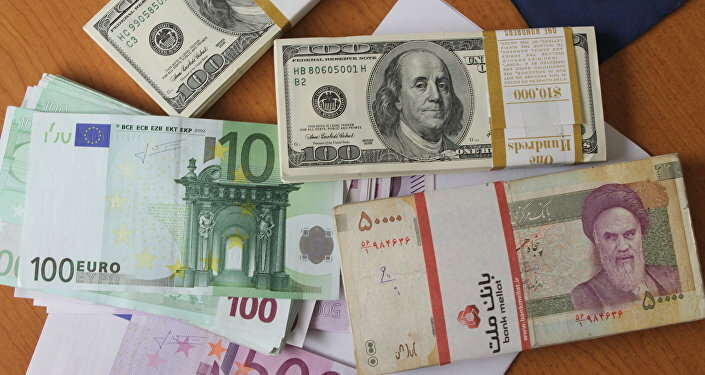 Hoshyar Rostami, an Iranian expert at Canada-based financial consulting firm Finapath, told Sputnik Persian that the cards allow Iranians to borrow more, but are not really credit cards in the ordinary sense. Previously, Iranian banking customers had been limited by the central bank to taking out loans of no more than 50 million toman, the equivalent of 500 million Iranian rials ($15,900). "If you had previously received a bank loan of 20 million toman, but then you went to take out credit in another bank, the central bank allowed you to take out a sum no larger than 30 million toman," Rostami explained. "These new so-called 'credit cards' have a few drawbacks. Firstly, Iranian banks don't have a validation system, they can’t work out the client's credit risk. In general, Iran's banking system is not very developed, its programs and hardware aren't modern enough," Rostami explained. In order to receive one of the cards, customers must provide documents proving the possession of some kind of deposit, such as property, against which to secure the debt. "There is another limitation. If somebody wants to obtain cash from the card, that would be considered misuse. It's not clear how they plan to monitor the process of obtaining cash," Rostami explained. "It's important that the top-managers of Iran's banking system understand that there are a lot of shortcomings to this project which need to be addressed. Today, this can hardly be called revolutionary for the Iranian banking system. Perhaps this is a publicity stunt for the upcoming presidential elections." "This project is unlikely to influence the flow of investment into Iran in the near future, it's too early for that. But of course there is potential," he said. Iranian banking customers are currently limited in their choice of credit institutions, since no foreign banks have begun operating there since economic and financial sanctions associated with its nuclear program were lifted in January. The US and EU announced the lifting of the sanctions following the nuclear deal reached by Iran and the P5+1 group of countries in July last year. The move enables Iran to access previously frozen assets, use international financial messaging services such as SWIFT, and sell oil and other raw materials to EU countries. However, the country remains subject to some US economic sanctions. In March, Iran's Supreme Leader Ayatollah Ali Khamenei accused the US of failing to fully lift sanctions as part of the nuclear deal. "The Americans have not acted on their promises and (only) removed the sanctions on paper," Khamenei said. Last month US State Department spokesman Mark Toner admitted that international financial institutions remain unclear about which US sanctions against Iran are still in effect. "There are sanctions, rather, that are still in place that financial institutions, international banks still don’t have a clear understanding of, and all of that weighs on, again, our ability or anyone's ability to engage in financial transactions with Iran," Tonor said. Amid such uncertainty, Russian banks have expressed an interest in providing financial services to the Iranian market. Earlier this month Bahram Amirahmadiyan of the Russia-Iran Friendship Society told Sputnik Persian that Iranian businessmen would welcome the prospect of closer financial cooperation with Russian banks, eventually allowing them to circumvent the need to use dollars or euros for bilateral transactions.